1. The S4 packs a jaw-dropping 13 mega-pixel back-facing camera. That's right, we said 13 MP. And it gets even better - the phone has a 2 MP dual camera which means you can record yourself simultaneously. We think you should try filming the next meteor shower. 2. If you're addicted to productivity apps (guilty!) you will love the S4's dual view feature that allows you to run multiple apps simultaneously. You can shop for space suits on one side of your screen while applying for a one-way mission to Mars on the other - or, if you're looking for something closer to home, tweet about the Phillies game while watching it live on your S4. 3. Gesture controls are yesterday's news - the Galaxy S4 comes equipped with eye control, giving you unprecedented flexibility when managing your apps, phone calls and music. The Smart Pause feature also detects your eye movements and pauses video playback when you are focused on something else. 4. The S4 boasts a 5 inch 1080p HD screen, allowing you to view high resolution HD shows, videos and movies in all their glory. The extra screen space also means you have a wider, easier keyboard to type on. 5. Samsung's S Beam takes NFC capability to the next level by offering the fastest and easiest way to transfer data just by tapping your phones to establish an immediate wi-fi connection. This phone transfers contact information, games and files at the speed of light. 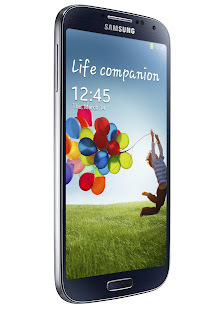 We will be unboxing the Samsung Galaxy S4 this Saturday, April 27 at all our retail locations. Stop by and get in on the action!